With soft hues that look incredible in any setting, peach pearls offer a beautiful twist on the traditional pearl. The Pearl Source carries gorgeous peach pearls at great prices. Peach pearls are one of the most feminine, soft colored pearls on the market. They offer a beautiful twist to what used to be a traditional gem. With such an iridescent sheen, these are some of the most unique pearls you can buy. These gorgeous gems come in an array of shapes, from traditional round spheres, to unique irregular shapes. Peach pearl jewelry can be found in many different styles and qualities. You’ll find peach pearl earrings, necklaces and bracelets here at The Pearl Source, all handcrafted to ensure the highest quality possible. For naturally colored peach pearls, turn to the Freshwater variety. These are the only pearls that have a peach hue by nature. Other types of pearls may be professionally dyed to take on the color, and look amazing too! The Pearl Source only sells authentic cultured gems, all of our peach cultured Freshwater pearls are certified and guaranteed to be high-quality. These amazing colored precious gems are the perfect accessory for any outfit. Our peach gems are cultured on pearl farms inside Freshwater pearl mussels. Each mussel has the ability to become nucleated on each side of its shell up to 25 times. Many are bred specifically to create peach pearl colors. In most cases, naturally colored peach pearls have hues of rose, gold, aquamarine and gold. 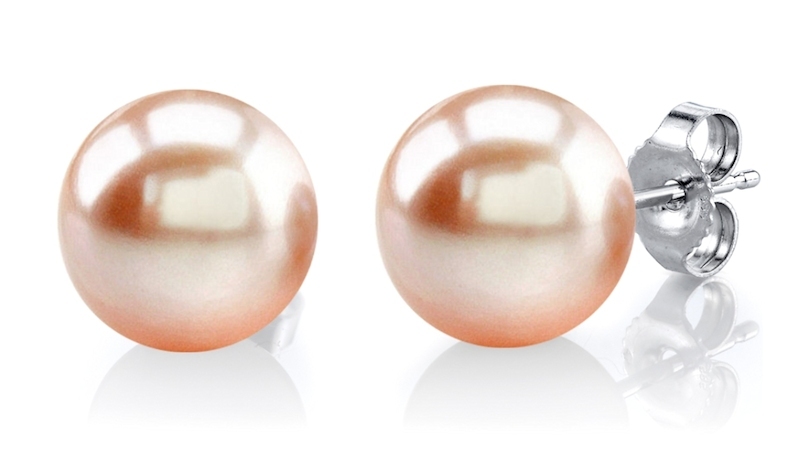 The cultured pearl sizes are generally between 4mm to 12mm in size, with the averages sizes being 6mm to 9.5 large. In recent years, however, pearl farmers have been harvesting “Edison Pearls” which have grown to be as big as a whopping 16mm in size. Authentic cultured pearls are dyed everyday to take on amazing colors. Peach pearls are no exception, pearl jewelry designers will take white pearls, and dye them to create peach pearl jewelry. When designing your own peach pearl jewelry, make sure your gems are eye-popping. Pair them with yellow gold to bring out the golden and peach hues of the gemstones, and give them a spark. White gold paired with deeper peach colored pearls will make the aquamarine hues in the gems come to life.